I am not sure this is the right place for this, but I had ordered 3 4'x10' zen banners (13oz) and they came in today. The previous banners I have ordered came neatly rolled in a tube for protection. Hemmed all the way around. Today, these 3 came only hemmed top and bottom and they were roll and then flattened? Is this common? I unrolled these and my heart sank. They are creased every 3 inches or so. I have hung them up to try and let their own weight take out the wrinkles but not sure if that will happen. Does anyone have any input on this? will those wrinkles go away? Is this how everyone gets their banners? They just seem like they were picked out of the bottom of a clearance bin.... dirty too. I hope I am just panicing for no reason and they will flatten out just fine (not sure how I could get vinyl on them the way they are) and should just wipe clean. Not sure what to do off hand about the unfinished look on the edges with no hem. One of them was even miscut and jagged. I've only ordered Zen banners once from US Cutter (I don't usually do a lot of big stuff) and they came in a HEAVY-duty cardboard tube with wooden plugs stapled into the ends - was a real pain to open - and the banners inside were dirty and there were marks from where the grommets had rubbed against the banner material. Now, having said that, they cleaned up beautifully and even the rub marks mostly disappeared with a quick wipe of RapidPrep, so it all worked out in the end. So, according to this, this is not supposed to be the way to receive my banners. I called US Cutter and now I have to take pictures, go online and initiate a return ticket with pictures, rebox them and take them to fed ex (you would think fed ex could just pick them up when the replacement package arrives) then call them with a fed ex tracking number before they will resend the new ones. I am just wondering what there is to prevent the next ones showing up the same way? Any way, US Cutter insisted they would make it right, it is just a wait and see thing at this point. I have no doubt they will get it fixed I am just wondering how long it will take. (by that I mean getting them packaged and shipped properly.) I wonder if this came from a different warehouse or something. Good thing I have a little time to get this project done. I haven't had any issues yet but have noticed things are different. I ordered 100 24x18 blanks and they usually come in the box made of coroplast that they receive them in this time they came split between 2 boxes stuffed with rolls of vinyl around them. And the way they started taping vinyl rolls leaves a mark which usually costs about 9" off the ends of the rolls. I've ordered close to 20 10yd. rolls in the last 2 weeks so that's a lot of waste. I have had this happen,and not JUST with us cutter. 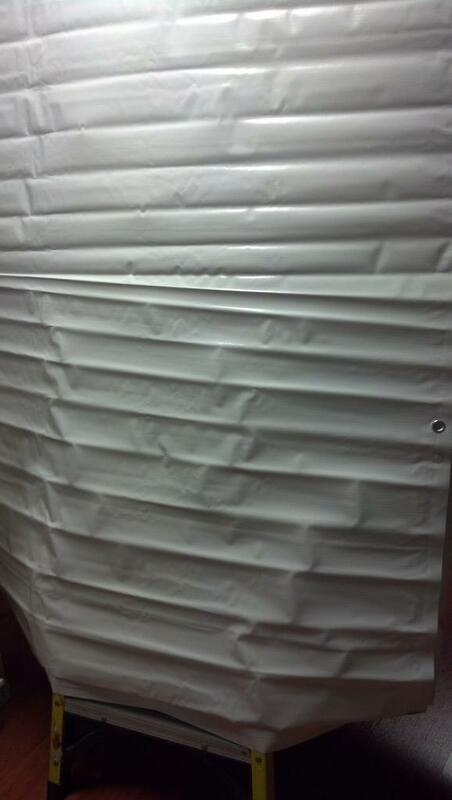 If a banner is shipped without a tube, it will likely flatten out. I get a tube, roll them as tightly as I can,and put them away in a hot place for a few weeks. If I was buying these for stock and had a few weeks I might give that a try. I see by the other thread I linked that guy tried several things (hot iron, sun) and didn't have any luck. I am gonna package these back up the same way they came and ship 'em back. Just keeping my fingers crossed they don't just grab 3 more just like these off the same shelf these came off of and send them. I does not appear to me this happened in shipping (especially the unhemmed ugly cut ends) They look like they were in a pile or bin with the weight of all the other banners on them. They were individually put into plastic sleeves with a label (no tubes). I bet they came off the shelf just like this and were tossed in a box and shipped. Looks like they were hacked off a roll to fill the order. I wouldn't use them at the shop like that, I like to keep my customers. and whomever packed it needs trained on packaging properly . US Cutter usaly gets it right but someone dropped the ball . I have submitted my ticket (with pictures). It was late Friday and I have not heard anything yet so I assume they are closed on weekends. Hope to hear something early Monday so new ones can get shipped out Monday so I will have them Tuesday. Was this sold as not hemmed on the ends? Or was it sold as a finisher banner? The description says "sewn in hems" and the picture also shows the ends hemmed. I have ordered these before in a different size and they came hemmed, and nicely packed, rolled and tubed.... no problems. So I am assuming they are supposed to have hemmed ends. I am confident they will get it right at some point I just hope it does not take several tries. I am lucky to have a little time on this project to give them another shot. This is not my first problem with them however. The other problem I had never got fixed via customer service (I had to give up on them) but was fixed right here on these forums by the good folks of this community! And now that you mentioned it..... I went and looked at the banners again. I guess I am not really sure what "sewn in hems" means, but I would think that meant there would be some kind of "thread" sewn into the hem. These do not appear to have that. Possibly folded over and double sided tape? I also went and checked (for reference) some (good) banners I have in stock..... they appear to be folded over and taped as well?!? What exactly does "Sewn in hem" mean? 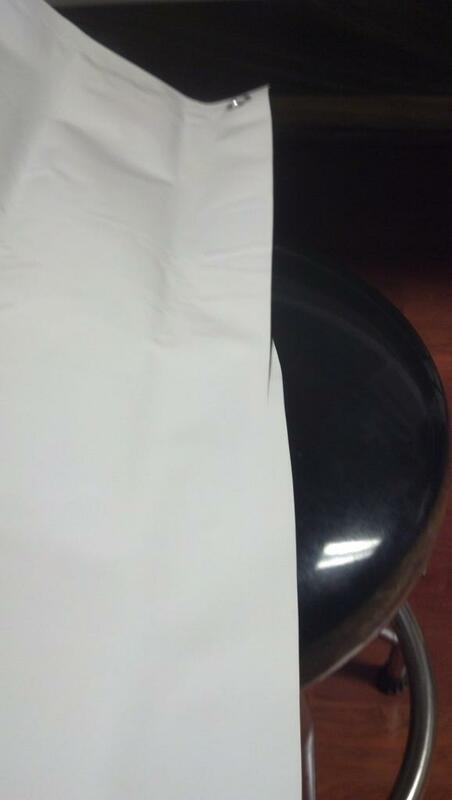 I just got a roll of banner for Uscutter and it came just like I like it no hems, no grommets, no banner tape. That way they have less to worry about screwing up. I have never bought a grommeted banner from them where the grommets were properly located. I have long since started making my own custom sized banners off of the 54" roll for print work that way I can hem tape it how I want, sew it how I want and grommet it where I want. I stopped using tape alone a couple years ago after 2 of my banners came back with the hem coming undone now they all get a trip to the sewing machine. $61 or $30.50 per banner $148 or $12.33 per banner and ability to make custom sizes by request. $238 or $20.67 per banner and much of this is a 1 time expense. I agree Jay, your way is better. I almost bit the bullet and went that route this time because of the size and expense of these banners. I could have bought the roll and punch etc and spent about the same but had the supplies for other banners. My main concern was the height of these. Not sure when I will need 4foot tall banners again. Seems like most stuff around here is 2 foot or so. So it came down to me wanting to wait till the next 2 foot banner order, then maybe I will take that step. I buy 54" because I can get (2) 2x banners sided by side with almost no waste just cut 26" by however long and that'll give you 2" for hemming so 2x 26" = 52" with a 2" strip for the trash can. Or cut a 3' banner and a small 1' banner. To be fair when I do 3' banners I usually throw out the strip since I rarely sell a 1'X banner. Dakota, that is nice but to be honest after running over 1500 grommets through the "frogger" Uscutter offers I can't see myself spending that much $$$ on 1. I know that when I grommet coro I get a small amount of chrosh but no 1 has ever complained about it. I just bought some 4' 14oz Bandana banner material for 2.30 or so a foot. Pre hemmed top and bottom with double grommets every 2 feet. Roll of hem tape for $6 and I'm set for a while.